Are you looking to attend a networking event with a difference? 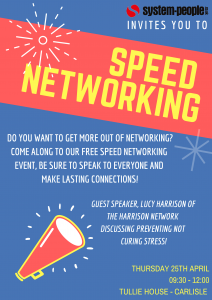 Ever wanted to join in with some “Speed Networking”? Come and join us for a FREE networking event with a twist. We also have Lucy Harrison from the The Harrison Network talking all things Stress Prevention. Tullie House – Thursday 25th April, 09:30 -12:00. Limited spaces so please email me at lyndsey.sisson@system-people.co.uk to book!